As the Supreme Court continued hearing on a batch of pleas challenging the constitutionality of Section 139AA inserted in the Income Tax Act by the Finance Act, 2017 which made Aadhaar mandatory for obtaining a PAN and filing IT returns, the Central government stoutly defended the biometric identification system. Appearing for the Centre, Attorney General Mukul Rohatgi said Aadhaar was very essential when the country was witnessing all round progressing especially technologically and it was an essential requirement to keep pace with the growth. He said the privacy concerns regarding Aadhaar were “wholly misplaced” and asked “what do you want ? a vacuum? It cannot be like that. An individual has a social contract with the state under which no constituent can say that I don’t want to be identified. The petitioners cannot claim to live in a utopia where they imagine there is no state authority”, Rohatgi argued. The court was hearing petitions filed by Ramon Magsaysay award winner Bezwada Wilson, former Kerala Minister Binoy Viswam and ex-Army officer S.G. Vombatkere, represented by senior advocates Arvind Datar, Shyam Divan, Sriram Prakkat and Vishnu Sankar, challenging the constitutionality of Section 139AA inserted in the Income Tax Act by the Finance Act, 2017. The provision makes Aadhaar mandatory for getting a PAN. Possession of an Aadhaar card is necessary for the continuing validity of an existing PAN and for filing returns under the income tax law. “When tax evasions are there, the government will try to bring new and new laws to stop leakages. We as citizens are like that... we don’t want to pay taxes, shame on us. This conduct and character is seen for example at the time of matrimonial alliance. Then the groom has the best income. The moment the estranged wife files a maintenance application, the same boy is a pauper,” Justice A.K. Sikri, leading a Bench comprising also of Justice Ashok Bhushan, had observed orally on Wednesday. 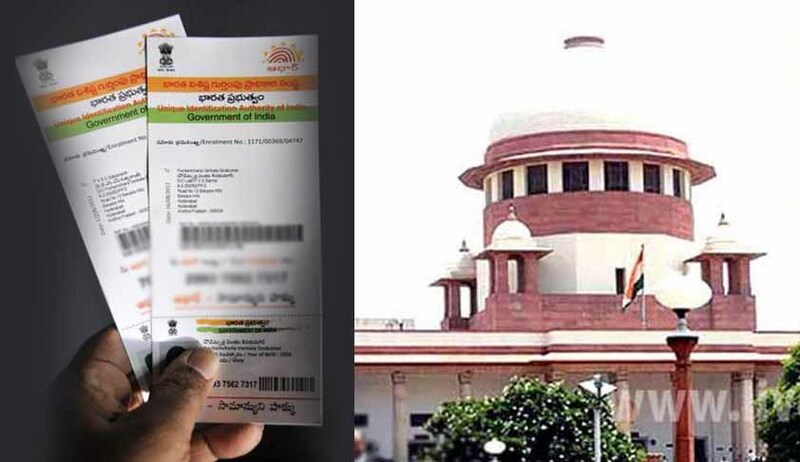 Arguing on April 27, the last date of hearing, Senior Advocate Shyam Divan, arguing for one of the petitioners who challenged Aadhaar-PAN linking under the Income Tax Act, has said before the Supreme Court that the linking is unconstitutional. “It is an illegal bargain of state with an individual for bio-metric details which is not permissible under law or Constitution,” Divan had argued before a bench headed by Justice AK Sikri. He also argued that Aadhaar is voluntary. It creates right for people, but not duty forcing them to give their personal details to a third party which is not government but a private agency. Forcing a person for biometric detail is intrusion into his body. Nowhere in the world does any state have a system which tracks you 24/7,” he said.